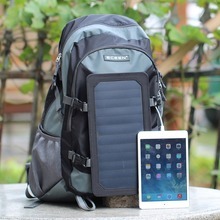 A solar-powered backpack is great for charging your phone when a power outlet is not available. They are good for hiking, biking or traveling. All of these backpacks have a solar panel built into the back of the pack. They will allow you to charge small electronics like an iPhone, iPad or a power bank. They are very convenient if you can not live without your electronics. They also can be great for a portable charging center. Some of these packs are very stylish. Let’s look at some we like. The ECEEN 7 Watts Solar Powered Backpack is a well-constructed nylon made pack. It is made from rip and weather resistant material. This backpack has many compartments for all of your items. The solar cells that come with this pack have a 22% transfer efficiency for reliable charging. The solar panel is stitched in a separate detachable sleeve and hooked to the back of the pack. It is protected by a weather resistant durable outer shell. This pack has a nice zipped mesh compartment to secure your electronics while they charge. You can charge your device through the voltage stability controlled USB 5-volt port. The ECEEN 7 Watts Solar Backpack comes with a 10,000mAh power bank that can be solar charged to provided juice for all of your electronics. It’s a good overall solar pack. Package contents: ECEEN Solar powered backpack, 7Watts solar charger panel, 10,000mAh Waterproof Power Bank, 2 User manuals and 1Pc micro-USB cable. The SunLabz Solar Charger Backpack is a small pack great for day hikes or trips. It has many compartments to hold all of your items. It is also a bladder backpack and comes with a 1.8L hydration pack. This pack also has a 22% high-efficiency cell and a 5-volt stability controlled USB plug to charge and protect all your devices. It comes with a 10,000mAh power bank. It has a great zipped mesh detachable pocket to hold your electronics. The solar panel can be removed for optimal sun exposure. This pack is lightweight and Eco-friendly. A solar-powered backpack can be a nice comfort when outdoors and traveling. 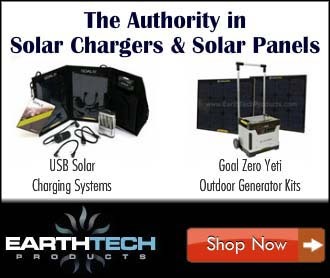 They provide a way to keep all of your electronics charged. Not to mention they are a cool Eco statement to have on your back.